Comic-Con International revealed plans Thursday to open a long-awaited museum in Balboa Park to support year-round interest in its world-famous annual event. The Comic-Con Center for Popular Culture will take over the Hall of Champions sports museum in the park’s Federal Building. While details are scarce, the center “will provide a year-round interactive celebration of the innumerable aspects of popular art,” according to a Comic-Con spokesperson. Speculation about a Comic-Con museum has existed for years but Thursday’s announcement was the first official word that organizers of the giant pop culture conference are seeking to establish a more permanent presence in San Diego. The Hall of Champions will relocate to the Western Metal Supply Co. building at Petco Park. “The Hall of Champions has our deepest appreciation in helping us to achieve this new chapter in Comic-Con history,” the spokesperson said. The hall currently houses the Breitbard Hall of Fame, which was founded by local sports legend Bob Breitbard to recognize athletic achievement in San Diego. Breitbard developed the sports arena in Pt. Loma. “My father would be thrilled with this opportunity to move the Breitbard Hall of Fame to Petco Park to usher in the next phase of the Hall of Champions,” said Gayle Klusky, his daughter and board member of the sports museum. 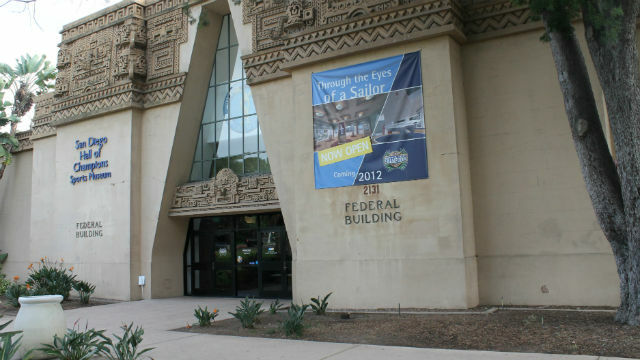 Many of the historical items in the museum will be housed at the San Diego History Center in Balboa Park. The new museum will be welcome news to the thousands of Comic-Con fans who have worried that the giant pop culture showcase would move out of San Diego because of the lack of progress on plans to expand the San Diego Convention Center. The Con annually attracts more than 130,000 people to its five-night, four-day event at the convention center, but in recent years has spread out its programs and events to neighboring hotels and buildings. The news comes just as Comic-Con prepares to host its other large event, the annual WonderCon Show in Anaheim. That event is scheduled to run March 31 to April 2 at the Anaheim Convention Center.